The illustrated talk I chose to do that day seemed appropriate for the occasion and the venue – The Civic Centre. Now with this talk I try to give my interpretation of how the area, now occupied by our present seat of government has changed in appearance over the past 250 years. 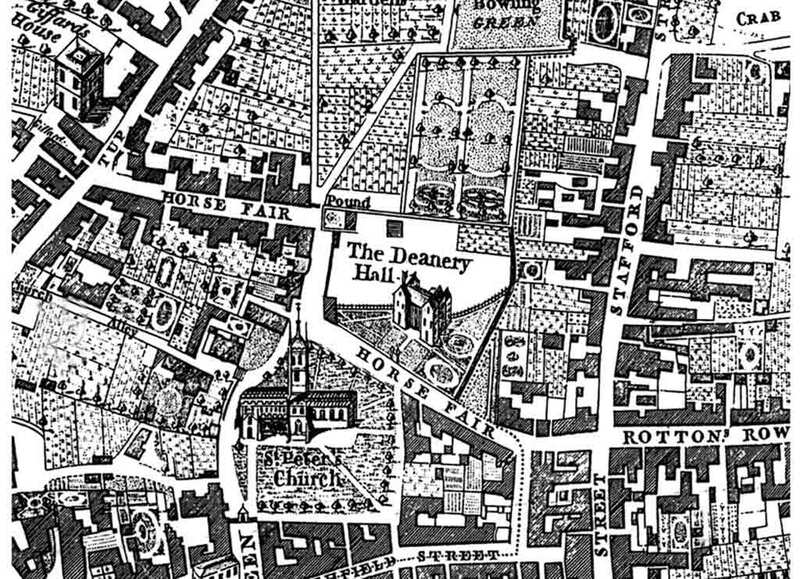 By the time Isaac Taylor’s map of 1750 was produced; this area, because of its location, immediately adjacent to the medieval church, had seen a steady growth in building for over 600 years. In close proximity to the church were; the Deanery, and Prebend Houses of Wobaston, Monmore and Willenhall. It has been suggested that in the 15th century, it may have had the appearance of an ecclesiastical close. Now if we fast forward 180 years, just eight years after the Deanery building was demolished in Wulfruna Street there is still just one survivor from the distant past at the top of North Street. The red brick gabled building, seperated from the old Town hall by a cobbled Corporation Street, was the former Monmore Prebend House; now converted into four retail units. The first of these is The Empire Restaurant, managed by Mrs Franks, next door is Danny Cohens furniture dealers. 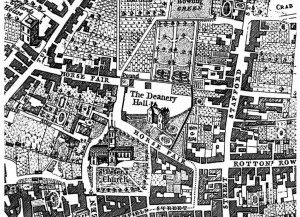 The following two businesses where a drapers, owned by Henry Corns, and finally – Greens’, a tailors shop. The low brick wall, trimmed with pillared gate posts fronted the entrance to a splendid 18th century house, at the time home to the Wolverhampton telephone exchange. This little block will eventually become the site in 1938 for The Civic Hall. The large tree in the front garden of the exchange, is adjacent to the sign for The Old Mitre Temperance Hotel, at the moment in the capable hands of Mrs Taylor the licensee. Mr Stokes is doing just as equally a sound job next door at Jessups Hotel. Hidden in-between the Old Mitre and Jessups hotels was Mitre Fold, in those days just a small carriageway, home to a few small terraced houses. 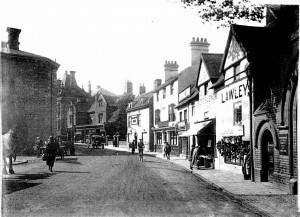 The final three shops before the large gates of the Education Offices on the right were, a mangle dealer, a fruiterer, and Lawleys boot dealer. Opposite these was the open space fronting the West side of Saint Peters’ Church, which was the site of the old Market Patch. The stage has now been set for 1953. A Vauxhall Velox stands at the head of the parade of (now classic) cars parked outside the Civic Hall in the summer of 1953. 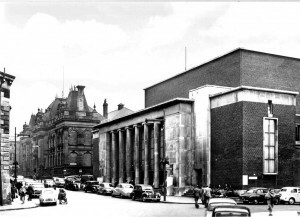 Opened in 1938, the CIvic and Wulfrun Halls had been mostly used for Symphony Concerts, Functions and Exhibitions, and what dancing there was, was strictly ballroom, Albert saw to that! The only time you heard the word “pop” mentioned, was when buying drinks at the bar. But this was 1953, Buxton & Bonnet’s in Dudley Street, were cutting a great Gaberdine Suit for the newly styled Teddy Boys, and these emerging Teenagers were just starting to call the tune a little around the town. Across North Street facing the Civic was the indoor Retail market celebrating its centenary, arguably the busiest place in town in those days on a Saturday, ruthlessly demolished in 1961. Of all the places that have gone from my youth, I regret the loss of this grand Victorian edifice most. The atmosphere of this old market at that time was so full of character. The cries of the traders, was a source of free entertainment, for the local shoppers and passers by. It seems nowadays with all the new rules and regulations that have had to be applied, the majority of stall holders have lost the will to get on and sell their wares, they just stand and wait for people to buy. But perhaps I’m a little prejudiced, and recall the visions of the Old Market with a rosy tint. 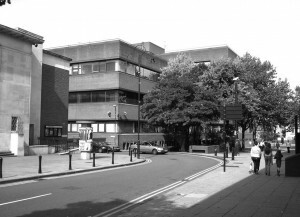 North Street today in 2010 is a small cul-de-sac, dominated now by the Town Hall, the Civic Hall, the Telephone Exchange, and of course – The Civic Centre. 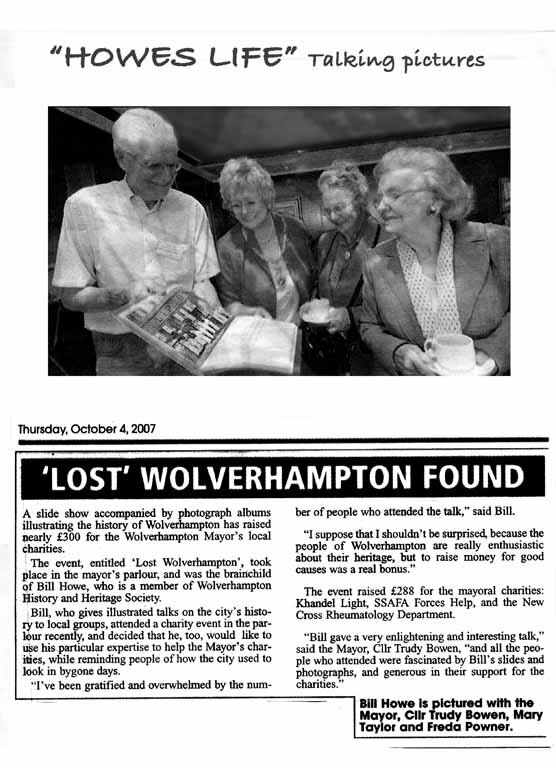 I myself write these little stories about old Wolverhampton, as a recorder, not a critic, but personally I believe that it would have served the town much better to have built the Civic Centre on Brickkiln patch and left the old Retail Market on this spot, where it had been for over a century. 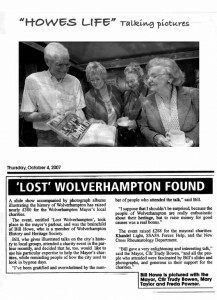 Love this site, Although i now live in the USA, i am a Wulfrunian to the core and it saddens me to see what we have lost. Does anyone else remember the education offices that stood where the extension to the telephone exchange was built at the top end of Mitre fold? as a telephone engineer i often worked in the exchange, then known as Red Lion Street exchange but now known as Mitre fold. 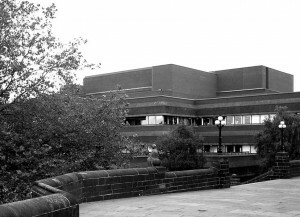 We would often play football or other games on the site of the demolished education building prior to the extension to the exchange been built. I use to work at the Telephone Exchange in Red Lion st. from 1962 – 1969 . I married a Telephone Engineer Richard Cooksley then we moved to Perth Wester Australia. I have been trying to get photo,s of the exchange and also any photo’s of Telephonists between these times but do not seem to have much luck. Any suggestions on where I can obtain any.